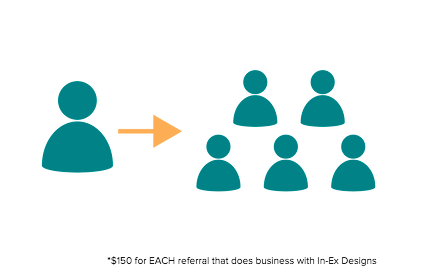 Interested in receiving rewards and incentives for working with our team at In-Ex Designs? We appreciate your feedback and use it to continue to improve and provide the best experience to all our customers. Help us to continue to improve our expert services by providing us with your feedback online, and receive a $50 Visa gift card as a sign of our customer appreciation. In addition, if you refer us to a friend or neighbor who retains our services, we are pleased to provide you with a $150 Visa gift card. So what are you waiting for? Write your review or refer us today to receive your Visa gift card! Currently, we are offering two incentives to our customers for sharing their experiences with friends, neighbors, and the online community. We invite you to take advantage of either of the following.